AGE Antioxidants - a range of nutrients to protect cells from excess free radicals including beta carotene & resveratrol, glutathione, selenium, vitamin E, alpha lipoic acid & coenzyme Q10. Patrick Holford Brain Food formula is a unique blend of vitamins, phospholipids & other nutrients to support the healthy functioning of the brain. 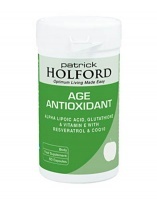 Patrick Holford Chill Food is a blend of vitamins, amino acids & plant extracts to support the body for the pressures of modern lifestyles. 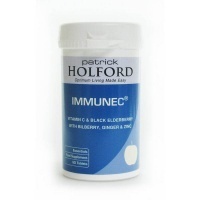 Patrick Holford Cinnachrome combines essential nutrients involved in blood glucose metabolism. Suitable for use by those following a low GL diet. Immune C is a specific immune support supplement providing potent Antioxidants ingredients. 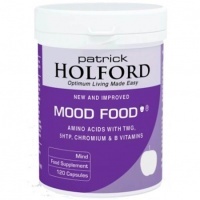 Patrick Holford Mood Food is used by the brain to manufacture dopamine & support production of neurotransmitters.